the ability to switch a track between mono and stereo !! Re: Ability to switch a track between mono and stereo! Another many-years-long request. Used to be in SX, from what I understand, then was removed. I wouldn't hold your breath -- they're stuck in the past on this one and some others it seems. Last edited by In_Stereo on Tue Jun 26, 2018 6:15 am, edited 1 time in total. I stopped using Mono tracks and make them all Stereo. Why not? Why even use Mono? lol . Record/mix/master Hip-Hop/R&B using Cubase since 2001. I would like to have... the ability to switch a track between mono and stereo !! While a button to switch between stereo & mono would be nice to have, it just struck me there is probably a workaround for now. But only for Pro users. I haven't tried this yet - the idea just occurred when I read this thread. Assuming you are generally using the Stereo Balance Panner. Switch it to the Stereo Combined Panner and set both the left and right positions to the center. This should sum the two together into mono. 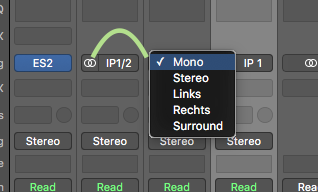 Now you can switch between Balance for stereo & Combined for mono. A little clunky but not too bad. a new tab in the MixConsole! here you can switch between: MONO <> STEREO,<>Surround<>Left<>Right. +1 For making this easier. Both of these free plugins sound like they will switch between stereo & mono - plus some other stuff. Yes, and there are others - my freebie of choice for this sort of thing is MUtility in the Melda free bundle. But that's not the point. What plug-ins like this do is take a stereo signal and make a stereo signal where the L and R channels are the same. You still have a stereo track. In many cases, that doesn't matter, but in others it can (pan laws do not apply on a faux-mono stereo track just for one example). You can convert any file to or from anything in the pool convert file menu. Now that I know it’s there I use it to change sample rates, channel width, etc. +1. This should've been added years ago.